The very first step in creating a household budget is to accurately figure how much income you're earning, and when you're earning it. Although this step seems obvious, you need to be realistic about how much money you actually have to spend every time you get paid. Your hourly rate or salary is called "gross" income. Thanks to taxes and deductions, your "take-home pay" could be much less. Grab a pay stub and take a look. Typically, American paycheck "deductions" from gross income will include Social Security taxes, Medicare taxes, federal income tax withholding and, in some cases, state income tax withholding. Depending on your employee benefits, you may also have health insurance premiums, insurance premiums, and retirement account contributions deducted as well. Being familiar with all your deductions can come in handy when you begin "tweaking" your household budget. You might be able to reduce some deductions, or increase others, in order to build your wealth more efficiently. Make a quick list of all your sources of income. Include sources that may or may not come from a job, such as government benefits, alimony, child support, interest, dividends, gifts, and so on. Next, going across the page, list your income amounts (net, not gross) and the frequency of payment. Remember, you want to work with "net" income when creating a household budget because that's the actual cash get to spend every time you get paid. 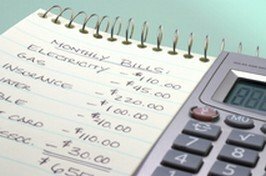 When you begin creating a household budget, you also need to decide what pay period your household budget will be based upon, especially if you're going to be budgeting money by paycheck. Do you get paid once a month? Then you should make a household budget that's based on a calendar month. Do you get paid biweekly? Then your budget should be a bi-weekly one. It gets a bit trickier if you have different pay periods for all your income sources, but the general rule of thumb should be to manage your budget based upon the least frequent pay period. "Why wouldn't I just do a monthly budget? ", you might be asking. Most personal budgeting books, articles and websites work with monthly household budgets. If you're creating a household budget "our" way, you'll effectively be taking your net income for an entire year, and breaking it down into pay periods. Then, you'll take your entire expenses for an entire year, and break them down into pay periods. You'll have what's called "even cash flow". By comparing pay period income to expenses, you'll finally have an accurate picture of how much you truly have "left over" each time you get paid! When creating a household budget, this couple will set up a bi-weekly budget pay period with $3000 in net income. On each bi-weekly payday, the couple will pay their bills and withdraw spending money according to their budget plan. They'll also pay bills due over the next two weeks. What happens to the off-week paycheck of the second spouse? Remember, he or she gets paid weekly. Well, their check is simply deposited, with the funds waiting to be added to the next bi-weekly paycheck. Do you see the benefits here? Instead of managing two different paychecks, the weekly paycheck is folded into the bi-weekly paycheck, and the family's income and expenses are managed in an even, bi-weekly basis. Are you working on a commission basis? That can make creating a household budget a bit tricky. What a great opportunity! The optimal solution here would be to budget all living expenses off the steady source of income, and use the irregular paycheck to save, pay down debt, cover irregular expenses or provide for recreational spending. If that's not feasible, try creating a household budget off the base pay of the irregular paycheck, if that's an option. Consider anything over base pay to be a "bonus". Budgeting money this way is the most difficult. You might be tempted to work with your higher paychecks and "best-case scenarios", but really, you're forced to deal with the reality that "worst-case scenarios" do happen, as well as irregular cash flow. In order to spend less than you earn, you need to budget off your "worst case scenario". Look back one to two years and find your "worse-case" paycheck. Consider that to be your base pay, and create a household budget based on your worst-case amount. Create a plan for any "extra" money you receive in each paycheck. I would highly recommend the first part of "surplus" cash go to a hefty savings account, nine months to a year's worth of living expenses at a minimum, in case those paychecks become even more irregular or varied. If your income doesn't vary much from year-to-year, but you receive the bulk of your income as infrequent bonuses or payouts, your strategy should be to save bonuses or payouts for a year, and then draw on them in the following year, even as you replenish the "fund" with that year's bonuses or payouts. It's very important that folks with irregular income maintain as little debt as possible. Keeping debt low, savings high, and personal budgeting very conservative will go a long way towards making irregular income as stable as anyone else's. Let's say our couple above receives a regular monthly dividend of $300. How would they work with that dividend when creating a household budget? Now, it's on to Step 3: Expenses!